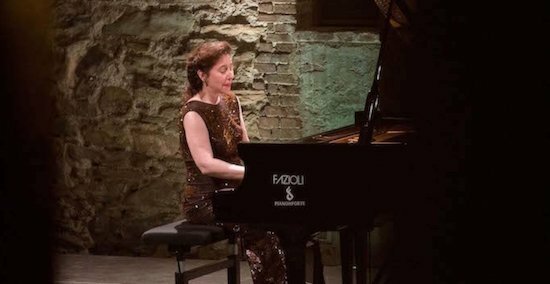 Our 9th visit to the Italian festival, established in a glorious Umbrian setting by the charismatic Canadian concert pianist Angela Hewitt OBE. Recitals are given in the courtyard of the Knights of Malta castle near Lake Trasimeno or in charming baroque theatres in Cortona and Perugia, a wonderfully converted Franciscan church in Trevi, piano concerto and orchestral concerts in a magnificent abbey church in Perugia. We stay in a charming hotel right on the lake which makes a relaxing base with its swimming pool and adjoining pier for gentle boat trips to the islands. Even on an excursion day there is time in the afternoon to rest or swim before supper and the 10 minute drive to the concert. Virginia Woolf wrote how she would far rather have stayed by the lake than in hot and steamy Perugia. Excursions are made to Assisi (Giotto fescoes), Perugia, Cortona and Orvieto (Signorelli frescoes). We follow the Piero della Francesca trail to Arezzo (The True Cross frescoes and Mary Magdalene) - Monterchi (the Madonna del Parto) and Sansepolcro (Resurrection and Madonna della Misericordia). Art history tours of the major fresco cycles cover the same ground without the concerts! We have lunches at carefully selected restaurants on our excursions and suppers at our hotel and also three very special gala dinners with Angela Hewitt (wine and coffee included). A short film about the 2013 festival can be viewed on YouTube. 8 concerts, 3 lunches, 9 suppers including 3 Gala Dinners. Single supplement £280. Flight Heathrow – Rome (dep Heathrow Terminal 5 at 12.45). Coach to hotel and supper. 09.30 Introduction to Passignano and free afternoon. Angela Hewitt with the Zurich Chamber Orchestra conducted by Sir Roger Norrington. Boat to the Islands – where St Francis once spent Lent. Lunch. Free afternoon. Anne Sofie von Otter (mezzo) and the cutting-edge American string quartet Brooklyn Rider in the programme they gave at Carnegie Hall earlier this year. Caroline Shaw: "Cant voi l'aube"
Colin Jacobsen: "For Sixty Cents"
Leóš Janácek: String Quartet No. 1 "Kreutzer Sonata"
09.00 coach to ASSISI with Basilica and Giotto frescoes. Lunch. Back to hotel for free afternoon. 4 Fazioli grand pianos in suitable pieces for 2, 3 and 4 pianos. Free morning. 12.00 Coach to SPELLO (Pinturicchio) and MONTEFALCO for the Benozzo Gozzoli Life of St Francis fresco cycles then TREVI for Supper and Concert in Chiesa di San Francesco. Free day – boat to Castiglione sul Lago or train to Perugia. Wednesday 5 July 09.00 PIERO DELLA FRANCESCA TRAIL: Arezzo (The True Cross frescoes) - Monterchi (the Madonna del Parto) - Sansepolcro (Resurrection and Madonna della Misericordia). Lunch. We see all the most important Piero frescoes and his birthplace. Final dinner at hotel. Meals in bold are included – with wine and water and coffee. Our hotel is a just short walk from the boat terminal so it is possible to go to the islands and back in a free hour or to sit by our private pool. The railway station is a few minutes away with a regular and easy journey into the heart or Perugia.